Time For Pictures! Crochet Baby Sully For A Newborn To 1 Month Old Costume! Great For Halloween Costume Pictures!! Enjoy! Awww...the pics turned out awesome. They really showcase just how amazing that costume is! 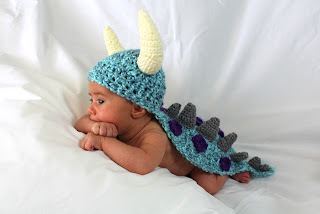 This little Sully costume for baby pictures is just so adorably crocheted. Beautiful work!